Ocean King 2: Monster's Revenge Coming Soon As A Game Board Upgrade Kit and Arcade Machine! Following the huge success of Ocean King: Return of the King, the number 1 income machine in Hawaii and the United States, comes Ocean King 2: Monsters Revenge! The long anticipated follow up to Ocean King is sure to be a hit, with its new characters, features and for the first time "BOSS characters" to defeat! Ocean King 2: Monsters Revenge will be available very soon as an Upgrade Kit for existing machines as well as 6 Player and 8 Player machines, perfect for updating your venue or gaming center! 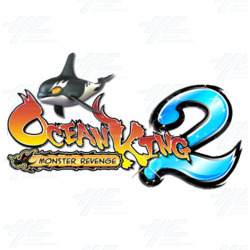 Ocean King 2 : Monster's Revenge Arcade Machine is a video redemption, fish hunting arcade machine game which is the follow up to the highly popular Ocean King: Return of the King. Ocean King 2: Monster's Revenge features HD 3D graphics on a large high resolution LCD monitor, which brings the new stages and characters to life with intense detail and vibrancy! This action-packed game has kept features of the original Ocean King: Return of the King, such as Chain Lightning, Overlord Whale, and has 16 returning characters, however also includes a huge number of exciting new features, characters, and mini games for players to enjoy. The use of the same game controls as Ocean King: Return of the King allows for a smooth transition between the old and new game, with players controlling the direction of their weapon using a joystick, firing with the ‘SHOOT’ button and changing guns with the ‘WEAPON’ change button. Using this, players must battle the monsters who have come seeking revenge of the fallen fish from the original Ocean King game. There are 16 returning characters from the first Ocean King game, including: Lion Fish, Flounder, Butterfly Fish, Clown Fish, Snapper, Fugu, Lantern Fish, Lobster, Devilfish, Saw Shark, Sea Turtle, Shark, Octopus, Killer Whale, Overlord Humpback Whale, and the revised Bomb Crab. There are also new characters included, such as Fire Dragon and Electromagnetic Cannon Crab, as well as a new game feature that has turned the low profit fish into Giant Fish in the game. The Giant Fish are fish like the Clown Fish, Butterfly Fish and Fugu, and are much harder to kill, so they are worth many more points! * Drill Cannon - ricochets from one side of the screen to the next, damaging and/or killing everything in it's path. Once it has travelled as much as it can, it explodes taking even more fish. * Chain Explosion Crab - a revised version of Bomb Crab that explodes not just once, but a total of 3 times, moving around the screen with each explosion! This is capable of killing all fish in range with a maximum of x10 credits! * Flamestrike De-Buff - this is random feature, where players must shoot the weapon in the specified time and they can get Double Score or Extension of Shooting time! Very useful for players competing for high scores. * The Prehistoric Giant Crocodile - he will attack players as he swims by, damaging their weapons. * The Night Monster - who makes the screen go dark, and it becomes very hard to see any of the other fish to score points. * Overlord Crab - all hail! This king of crabs can be taken out either by damaging his pincers or killing him directly. * Deep Sea Octopus - this monster is too huge to fit on the screen, players must attack his tentacles to defeat him! Another game feature is a never-before-seen mini game called Battle in the Golden City, which is free to enter. The game appears randomly and players must catch the fish within the time limit. Score potential is unlimited and players can get rewards, such as Double Treasure Chests! The Ocean King 2 : Monster's Revenge is an action-packed game loaded with fresh new characters, new game features and new mini-games, offering more content than it's predecessors! This game builds on the phenomenal success of the Ocean King which worked in a variety of locations and was a top income earning machine, as it was suitable for players of all skill levels - now they can experience a whole new level of enjoyment with the Ocean King 2!